Removing body rust can preserve the integrity and appearance of your vehicle. To do so, first identify the type of rust on your vehicle and equip yourself with the right tools to get the job done. You’ll find the goods you need here at Raybuck. Everything from rust prevention to replacement panels will help you solve any rust damage on your truck or car. Our parts and products are as hardworking as you are and will stand up to whatever you put your vehicle through. Don’t let rust take over your vehicle. The best time to treat your vehicle is when you have small surface rust spots. But it’s never too late to remove rust. Even in some of the most advanced stages of rust development, you can still save your vehicle. Here’s what you need to know about getting rid of rust and preventing it from returning. Rust can damage your vehicle in a variety of ways, and the problem will quickly progress if you wait too long to correct it. Over time, minor surface rust can penetrate deeper into the metal. Even worse, what looks to be minor surface rust may just be the tip of the iceberg, as it’s very common for rust to start from the inside of a panel and work its way outward. Ignore rust spots long enough, and you could find yourself with a vehicle filled with flaky rust holes. Surface rust only affects the top layer of your vehicle’s body panels. This rust appears in nicks and chips in the protective paint coating. Treat rust at this stage for the most straightforward process. You will also get the best results with the least amount of effort if you treat surface rust immediately and do not allow it to spread further. Pro Tip: The best way to avoid surface rust is to keep a small bottle of automotive paint (color to match your vehicle) in your garage and touch-up minor nicks and scratches as they happen. Scale rust occurs when you leave surface rust to continue the corrosion process until it pits the metal. Chemical reactions cause rust that begins to damage the metal of the body panel itself. Road salts and salt spray are notorious causes of premature rust in vehicles, especially in Northern states. These salts create a chemical reaction that speeds up the corrosion process. Eventually, scale rust will work its way through the surface of a body panel and affect the integrity of the metal itself. Penetrating rust is, as the name suggests, rust that creates holes in the metal. This type of rust is the most advanced stage. You will need to replace portions of, or entire, body panels to repair the damage. The best method to avoid penetrating rust is to prevent or repair surface rust in the first place. Pro Tip: Fluid Film applied to the undercarriage of your vehicle is an excellent way to protect the chassis and inner body panels from damage caused by road debris and road salts. This protectant is so effective that the marine industry has used it for over 50 years. If the rust gets deeper than minor pits, you may need to spot sandblast or replace the body panel. If the rust is extensive, body panel replacements are typically easier to install than patches, and the final product often looks better. When working with auto paint and sanding, protect your eyes, skin and lungs. At a minimum, protective goggles, gloves and a painting mask should be used. The process to repair small rust spots depends on how far the rust has penetrated into the metal. Surface rust is a straightforward process that is similar to fixing a scratch or paint defect. Scale rust, which goes deeper, requires more effort to get rid of on your vehicle. If you have the right products, though, the process is fairly straightforward. After you’ve removed the rust, protect the surface from future corrosion by using Zero Rust paint as a base layer. This product is designed to seal the affected area from oxygen, providing superior rust protection for whatever topcoat paint you apply. Once dried, you can apply an automotive paint to blend the repaired spot into the rest of your paint color. Prepare the Area: Prep your workspace. Tape plastic sheeting over your vehicle, leaving a gap the size of the treatment area with a few inches on all sides. Don Safety Gear: Put on your protective eyewear, gloves and dust mask. Clean the Surface: Use wax and grease remover to clean the area that you are about to sand. If you don’t clean the area prior to sanding, then the sanding process can contaminate the metal. Sand Away the Rust: Use sandpaper or a small grinding disc to sand out the rust spot, including the paint directly around the rust area. Keep going until all the rust has been completely sanded out and you see the shiny metal base. Clean the Surface Again: Clean the area with wax and grease remover to ready it for primer and paint. Wipe off Dust: Use a lint-free cloth or tack cloth to wipe away any dust from the surface. Apply Zero-Rust or Other Automotive Primer and Paint: If you use a rust-prevention paint like Zero Rust, you don’t need a separate primer. It should dry to the touch in 30 minutes, depending on temperature and humidity. Apply a second coat if needed after the first dries. Once your primer or Zero Rust dries, scuff it, clean it and then apply your topcoat of automotive paint. Buff the Finish: Buff the treated area with a microfiber cloth or a lint-free cloth. Wait for a Wax: Don’t wax your vehicle for at least 30 days. Putting off washing and waxing allows the finish to completely cure. Remember to protect yourself when working with automotive paint and sanding. At a minimum, protective goggles, gloves and a painting mask should be used. Scale rust pits into the metal, causing more than just surface damage. You will need to get more aggressive with your techniques to fix scale rust damage. Ignoring the problem will allow it to get worse until it eats through the metal completely. Keep in mind, fixing scale rust will require more effort and time than repairing. Prepare the Area: Cover the area surrounding the rusty portion with plastic sheeting. Tape it in place. Allow at least six inches on all sides of the rusty area for working space. Put on Safety Gear: Protect yourself by putting on safety goggles, gloves and a dust mask. These precautions are even more critical with scale rust removal because you will use a grinding tool to get rid of the problem. Grind the Rust: Use a grinding tool (usually a right angle grinder) with a 2″ or 3″ grinding disc to remove the rust. 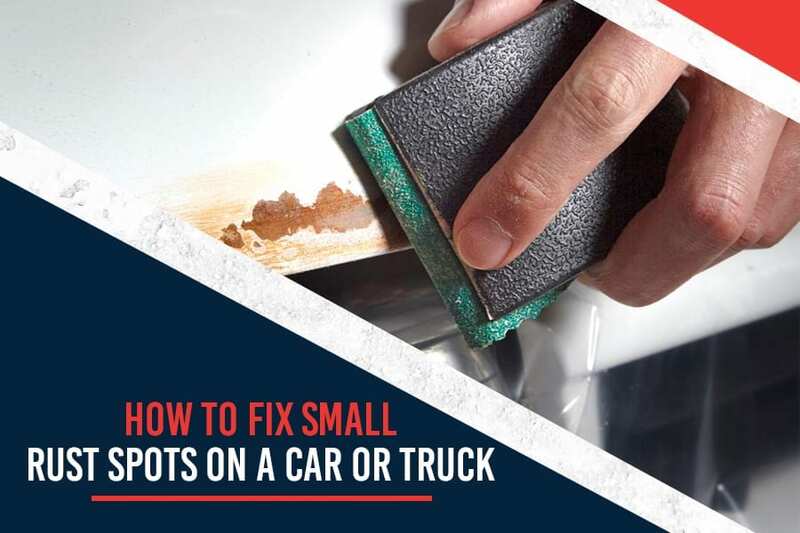 You can start with an aggressive grit, such as 36, to remove heavy scale, and then move to a less aggressive grit, such as 80 or 120, to remove the remaining rust and surrounding paint. Mix Prep Step: Combine Zero Rust Prep Step with hot water. Use 12 ounces of product per gallon of water. Fill a spray bottle with this solution and spray the affected area. Rinse Prep Powder off: Use a rag and clear water to wipe off the rust conditioning powder solution. Fill in Depressions: Use body filler to fill in depressions in the pitted metal. Sand the Surface Smooth: Use sandpaper and a sanding block to smooth out the body filler, metal and surrounding paint edges. Start with 180 grit and work your way to 600 grit. Each grit will help remove sanding grooves left from a previous step. Clean the Surface Again:Clear off dust and debris and clean the area with wax and grease remover to ready it for primer and paint. Apply Primer and Paint: Apply two coats of Zero Rust paint or primer to the prepared, clean surface. Wait for each coat to dry before applying another. Once the primer or Zero Rust dries, sand the entire area again with 600 grit sandpaper, clean with wax and grease remover, and then topcoat with your automotive paint. Buff: Buff the dried coating with a lint-free cloth. Wait: Don’t wax the freshly restored area for at least a month. If the scaled area that you’re working on is the undercarriage/frame of your vehicle, there is no need to topcoat over the Zero Rust paint. For added chassis protection, use Fluid Film. Fluid Film creates a barrier against the rust-causing agents your ride may encounter on the road. Rust that penetrates deeply into the metal or that creates holes requires a replacement panel. For severe rust problems that cannot be repaired by the two processes outlined above, you will need to cut out and replace the body panel, or a portion of it. While you may be able to patch a portion of the affected area with a piece of sheet metal, it’s often easier to just replace the entire panel. To install a patch, you must cut out the portion of the original panel that has the severe rust and holes and then weld the patch in its place. The finished appearance will depend on how good you are at welding and the quality/thickness of the sheet metal patch. For larger areas, or areas that overlap body lines, install a replacement body panel. Choosing a new panel for your vehicle is simple. Enter your vehicle’s year, make and model into the search bar on this site to see what’s available. We have replacement panels for models dating as far back as 1947. Our replacement body panels are designed to precisely conform to the exact specifications of the original. Our panels are made from heavy-gauge stamped steel and utilize 3D scans of an OEM part to ensure perfect fitment. The engineering precision ensures the panels fit without modifications. Cab Corners: Cab corners face abuse from road salt and debris. Their shape can make rust removal difficult, and if you’ve put off the job you may need to replace the whole corner. We have cab corners for trucks back to 1947. Truck Bed Panels: Truck beds take a beating from the elements and daily use. Whether rust or damage gets to them first, at some point you will need to replace some portion of them. We stock lower quarter panels and bed panels for both trucks and SUVs. Wheel Arches: Wheel arches catch debris your tires kick up from the road, including corrosive road salt and water. These parts are prone to rust, but with our selection of wheel arches for vehicles from Chevy to Ford to Dodge, you can replace them easily. Doors: Rusted through doors create a safety and security hazard. Don’t settle for subpar parts. Find replacement lower door panels and all the interior hardware you need, like window regulators, handles, strikers and more. Rocker Panels: Rocker panels on almost every vehicle hold road salt, mud and road debris and eventually rot out. We carry a huge selection of slip-on and weld-on rocker panels for many makes and models of cars, trucks, vans and SUVs. When your vehicle has reached the stage of rust damage that requires replacing a panel, turn to us at Raybuck. You will find high-quality panels made to OEM specifications at lower prices. Don’t forget the rust-inhibiting paint and rustproofing materials that we carry as well. With paint like Zero Rust you can protect your newly replaced panel, even in harsh conditions. Zero Rust performs exceptionally well in tests, exceeding the 2,000-hour salt spray test. If the rust reaches the stage where the frame of your vehicle is penetrated, get a professional inspection. Rust can compromise the strength of your vehicle’s support system. A rusted frame could cause severe problems in the future, and most home mechanics will have trouble properly evaluating and properly repairing the damage. If your vehicle’s frame is in good condition, you can help keep it that way by using Fluid Film to protect the undercarriage of your vehicle. As much as auto manufacturers prepare their vehicles to prevent and reduce rusting, their efforts always seem to fall short. An in harsh climates, vehicles are even more susceptible to damaging rust. Take action now to prevent rust from forming on your vehicle. Start by applying rust inhibiting products such as undercoating or Fluid Film. If you already have rust damage, then look at applying a rust inhibiting paint, such as Zero Rust prior to an undercoating. Use these before rust takes hold on your car or truck or after treating a corrosion problem to prevent future issues. When rust eats through the body on your vehicle completely, step up your game. Auto body replacement panels restore the integrity of your ride’s body. We have replacement panels that meet or surpass OEM standards. Never worry about buckling, warping or ill-fitting panels again. The parts we sell are crafted with thick gauge steel to ensure panel longevity and durability. We have the materials you need for removing and preventing rust. Trust us to provide you with parts to keep your vehicle safe and looking great. Our product line also includes everything you need to restore your vintage vehicle. We have a history of more than 30 years of serving our customers and working on vehicles ourselves. Thanks to this longevity in the industry, we know what our customers need. Check out the high-quality products on our website to see long-lasting rust prevention, repair and restoration options.